THE VIKINGS were well-known for sailing in dragon-headed long ships to raid and plunder the coastal villages and towns of Europe. All these happened about a thousand years ago but even today, when we look at movies and comic book drawings of the bearded warriors wearing helmets with curved horns, and carrying giant battleaxes on their shoulders, it is enough to send a shiver down our spine. Not everything depicted about the Vikings was true, of course. For one thing, they didn’t wear helmets with horns sticking out – it was the invention of modern-day raconteurs. And the Vikings were not dirty wild barbarians with unruly beards. They bathed regularly and were particular about wearing clean clothes. And they enjoyed listening to epic songs (known as sagas) of gods and heroes. Today, we call it rap music. Their religion, too, was sophisticated. They worshipped Odin the all-wise father of the gods who plucked out one of his eyes to acquire wisdom. There was Thor – made popular by Hollywood – the god with a hammer that could kill giants and smash almost anything. And there was Loki, god of cunning and street wisdom. The Vikings were skilled navigators who sailed and settled in lands far from Europe, such as Iceland, Greenland and North America, long before Columbus “discovered” the New World. What was the secret that made them successful in their battles and conquests? Historians would tell you one reason is their superb warships that could hold up to 100 men, and yet had a shallow draft designed for speed as well as navigation into water that was less than a metre deep! Such ships could easily be pulled up on shore to disgorge a band of fierce warriors, and just as quickly pushed to sea during a retreat. One author, however, has suggested an dditional factor often overlooked, for the Vikings’ success – the simple fact that they rowed themselves to battle. The Romans and other ancient seafaring nations also had warships, but they depended on slaves to row for them. In a Viking long ship, every seat was reserved for a fighting man, so there was no room for slaves. By rowing, the Vikings kept their minds and bodies fit and focused, and ready for battle at all times. Strong, self-reliant, aggressive tribes who were successful conquerors soon acquired large empires and slaves. Eventually, the rugged conquerors became soft and weak, and were in turn overthrown. Think of the Romans, the Mongols, the Manchus, and Singapore. Yes, you’ve read me correctly, Singapore! A hundred years back, Singaporeans were tough-minded immigrants who struggled for a livelihood in this tiny island that has no natural resources. My father and most of his relatives and fellow villagers who arrived in Malaya and Singapore from Guangdong Province in the 1930s, worked from dawn till night, in rain or blistering sun, doing manual labour as street hawkers, warehouse coolies, carpenters, rubber tree tappers, tin miners, vegetable garden farmers, lorry drivers, back alley barbers, cement mixers, and more. The only idle people then were secret society thugs, cabaret minders and opium den operators. Through industry, intelligence and some luck, Singapore developed into a prosperous nation, where its people now enjoy the luxuries and indulgence that cash and credit card can buy. We the citizens of Singapore no longer need to push food carts on the street or tap rubber trees in pre-dawn darkness or carry gunnysacks of rice from bumboat to warehouse. We the citizens now hide in airconditioned cocoons. We the citizens cannot walk more than five minutes outdoors, so we must have train stations at our doorsteps, or we call a taxi. We the citizens don’t even have the energy to climb a flight of stairs, for crying out loud. We the citizens have stopped using our muscles to row the boat of life, so we hire foreigners to be nannies and domestic maids, sales girls and counter clerks, massage therapists and call-girls, cooks and waitresses, trash collectors and road sweepers, bus drivers and construction labourers, nurses and healthcare workers, and more. We the citizens indeed are too preoccupied with thumbing our smart phones and updating our Facebook entries, and visiting condo show flats, to do a lick of work. How then do we return to the self-reliant mindset of our fathers and grandfathers, so as to resume the lean, mean fighting form of old, that can take on heavy tasks and hard challenges and know we can overcome? It’s like an overweight person asking how they can shed kilos and regain their slim figure. In their hearts, they know the answer – expend more calories than what they consume. In other words, eat less and exercise like mad! • Re-focus the school system to emphasise sports and physical activity, from kindergarten to tertiary. Make sports and fitness mandatory subjects at ‘O’ and ‘A’ level, and in ITE and polys. If you don’t pass your fitness and one sport activity, you don’t pass, period. • Work permits to be issued to domestic maids only for families with pre-primary children or disabled individuals or very old folks. No one else gets foreign maids. • Girls at 18 go into National Service; this means all young people undergo training that instill discipline and a rugged spirit. • Transform the expensive National Day Parades from a spectator show to a mass physical participation event. Split it into a dozen smaller events in different stadiums. People are encouraged to join the NDP near their home, with the objective of demonstrating their physical prowess in selected sports. The ultimate goal is for every able citizen to be certified as a mountain biker, a tennis player, a 10km runner, an archer, a canoeist, a Judoka, a Muay Thai boxer, a 100m butterfly swimmer, whatever. To be certified in that sport, you must demonstrate the required physical skill in an NDP event. By the way, bowling, folk dancing, golfing, strolling in the park and horseback riding don’t count. • Impose a total ban on alcohol consumption. The US tried it once in the 1920s but it didn’t work. Singapore is no bigger than the backyard of an American city, so perhaps it may work. Alcohol befuddles our mind, gives us diabetes and liver cancer and causes fatal road accidents. Hence, not drinking alcohol increases our chances of a longer, healthier life. Drastic situations call for drastic action. 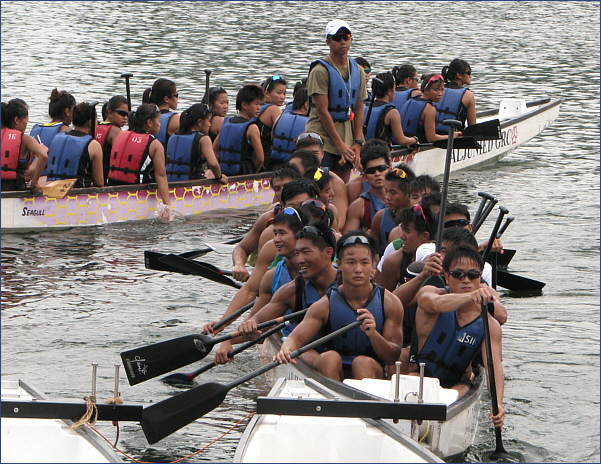 If we don’t have the strength or inclination to take up our paddle to row, the Singapore dragon ship will be going nowhere.